CAMP ARIFJAN, Kuwait – United States service members and coalition forces participate in the combat swim, physical fitness test, range qualification and ruck march events of the German Armed Forces Badge (GAFB) for Military Proficiency from April 8 to 11, 2019, at Camp Arifjan, Kuwait. U.S. Army Central hosts events such as the GAFB to enhance service member’s personal abilities to stay combat ready which improves overall capabilities. 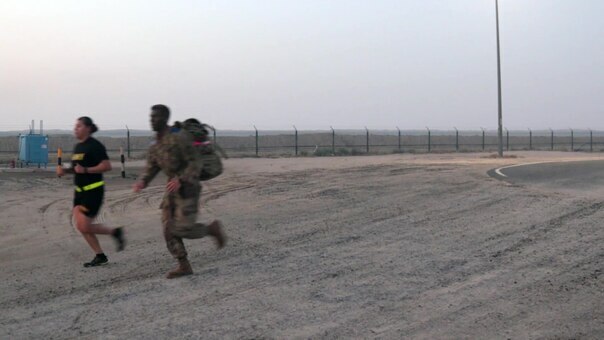 This work, Service Members and Coalition Forces Awarded GAFB at Camp Arifjan, by SGT Christopher Lindborg, identified by DVIDS, must comply with the restrictions shown on https://www.dvidshub.net/about/copyright.